Clare & Illingworth has always been very actively involved in the promotion of both Knutsford and Wilmslow and we sponsor, fundraise and promote our towns with a passion. You’ll often hear Richard talking to local people about the history of Knutsford and all the colourful goings on from the past that he has learnt about via the people of Knutsford and the Heritage Centre based just around the corner from the practice. This year we have helped by sponsoring The Knutsford Colour run for the Tennis Club, the Heritage Centre and the Knutsford Promenades. 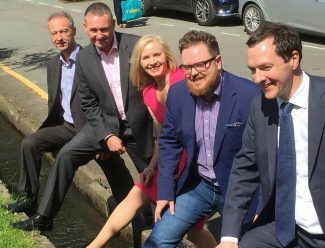 The most recent news article you may have seen is Richard fording the River Lily in Knutsford next to George Osborne MP to help promote the ‘Canutes Crossing’ celebrations which you can read more about by visiting www.knutsfordpromenades.co.uk and the article from their website below. “Canute’s Crossing is a free-to-all community event, celebrating the legend that in 1016 King Canute ‘forded the Lily’ and gave rise to the town’s name, recorded as Canutesford in the Domesday Book. Designed as a fun community event to celebrate the ‘kicking off’ point of the Knutsford Heritage Open Days’ celebration of 1,000 years of the town’s history and its famous townsfolk, this event has captured the imagination of Knutsfordians and visitors alike! Already the special Legacy Book has been signed by Christian Wewer, the Danish Consul who along with Knutsford Town Mayor Cllr Tony Dean did the first ‘official’ crossing of the river. They were swiftly followed by some of our early sponsors and representatives of Brook Street Heritage Site and the Tabley House Collection – Knutsford’s two Grade I listed buildings. Since then chef Raymond Blanc wholeheartedly embraced the concept when he visited Knutsford to launch his new Brasserie Blanc (one of our lovely sponsors). And Tatton MP George Osborne was very keen to lead the way when he, along with Richard Clare of Clare & Illingworth, and Richard Milkins and Brendan Flanagan of Cheshire East (all sponsors!) forded the Lily. We want to see 1,000 people cross the Lily from now to Saturday 10 September. That’s the date the big event takes place when artist Russell Kirk and the Chester Vikings will lead a fun event which will celebrate famous Knutsfordians. The Lily can be crossed on foot via the pedestrian or road bridges. Residents and visitors are encouraged to attend on the day wearing fancy dress to represent their favourite historical Knutsford character. Participants will be invited to help to assemble a piece of community artwork made by 1,000 hands, designed by Russell Kirk, and record their names in our Legacy Book. Look out for more fundraising information here and in the local press over the coming months. This entry was posted on Friday, August 5th, 2016 at 1:56 am and is filed under All, Community. You can follow any responses to this entry through the RSS 2.0 feed. You can leave a response, or trackback from your own site.